This is a great analogy, Susan. It is a journey that requires effort and endurance. Congrats on your progress! Yes, I can see how a writer's life needs to be disciplined like a marathoner! I think by having a target, like a writer's conference to attend, can help achieve goals. I just recently joined a Writer's Group and we have goals to achieve each month which helps keep me stay accountable. Hi Karen - Thanks! 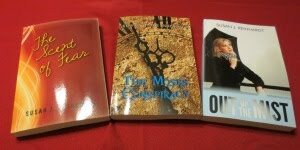 I never dreamed how long it would take to get my books published. Hi Jean - Thanks for your kind words.